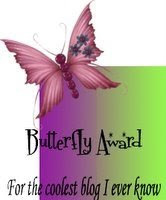 Diamond at My Pretty Pink Blogette was kind enough to bestow me the Butterfly award, for having a "beautifully simple blog". My Mr. has been mentioning that I should be getting paid to blog, then we'd have no worries, LOL. I like it without ads or anything, and it makes me feel good to know that others appreciate it as well, Thanks Diamond! "One Bourbon, One Scotch, One Beer"
I hit the pavement this morning to do a bit of fund raising. I finally got my letters sent out, thanks in part to my MIL who was kind enough to stuff and (return)address the envelopes for me yesterday. So, I decided that rather than wait for a "good" time (cause who am I kidding, it's never a good time), I'd just get it over an done with. Now, my committee members have been doing their fare share for sure, hitting the downtown local businesses...After I was finished this morning I think they got the easy ones, LOL. "Why don't you call me back no more? Why on earth can't you just pick up the phone? You know I don't like to be alone." Alicia Keys - How Come You Don't Call Me? I got the old "we have a procedure" at most places I stopped at (yes, I looked on all of their websites and found no info on it, so I had no choice but to go in and talk to them in person, which was kind of awkward with a little one in tow). Along with that speech, I was allowed to leave letters at most places who didn't have a manager or owner available. In any event, I managed to knock down two small strip malls, and got halfway through a third before H decided he wanted to come home and nap. On the bright side, I did get a promise of a gift basket from Bob Evans. Hopefully I can get more done tonight and still leave a bit of time to put together the Santa costume for tomorrow night. I'm pushing it...I know. Thank god for caffeine. I love a challenge I suppose. What am I doing here at all?" Then you begin to make it better"
I got most of my stuff cut out last night, and even went out for a bit of midnight shopping (once again, I gave up on the "good" time). I finished the shopping for the boys finally. I'm hoping I can finish their PJ's before Christmas now, LOL. I also looked up some Christmas games online, and am having trouble narrowing it down to one I want the kids to play on Friday. :oP Maybe I'll take another look, usually one just jumps out at me and I go with it, not this time. hmm. I talked to my Gramma the other day as well, first time in forever. I haven't talked to her since we figured out we're headed back to BC. She was in tears when I told her of our decision, and I haven't had the heart to call back cause I know it won't be until June. I guess it feels like the more I chat with her the more homesick I feel, especially around the holidays...which is weird, cause she's so full os idiosyncrisis. She's one of those Gramma's who you just love to chuckle at because she has so many antics it's hard to pick one to be annoyed at. It's not that she tries to be annoying, it's just that she works so differently from me in some ways, and we're so alike in others it's almost scary. Oh my god, I'd give anything to be with my family this Christmas. Miss you miss you can't feel whole"
Cards, Parties & My Mr.
You Don't Like The Dentist? ?